Characteristics：Specialized in working some materials like acrylic, plastic, and related ones. And work custom order according to special request. 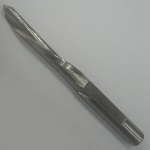 Single flute may speed the working period and shorten the time.